2015, The Year of The Euphonium! 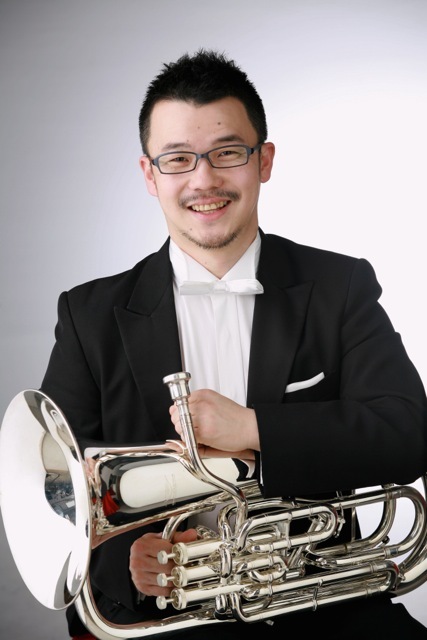 While the “Fourth Valve” tm was launched on the last day of 2013, it was not until 2015 that it featured its first interview from a euphonium player. Then the flood gates opened, and 2015 was, without a doubt, the year of the euphonium at davidbrubeck.com! Usually thought of in the niche of bands and brass bands, these euphonium virtuosi reflect an astonishing level of musical accomplishment in a variety of settings. From the out-of the box innovators of the celtic infused Matthew Murchison to the tango inspired Koichiro Suzuki, from the quadruple threat virtuosity of Demondrae Thurman to the thoughtful brilliance of Jamie Lipton and Mitsuru Saito, from the bop of Marc Dickman to the quintet experise and “what do you call that?” of Lance LaDuke to the smooth southern gentlemen Adam Frey and Martin Cochran. Did I mention the sensational Lauren Curran? She’s the soloist, chamber musician, and Army Field Band spokeperson who stood up to Jim Rome and refuted his negative comments regarding band musicians. We have forged a super interview out of selected responses from this unbelievable team. Not to be missed! 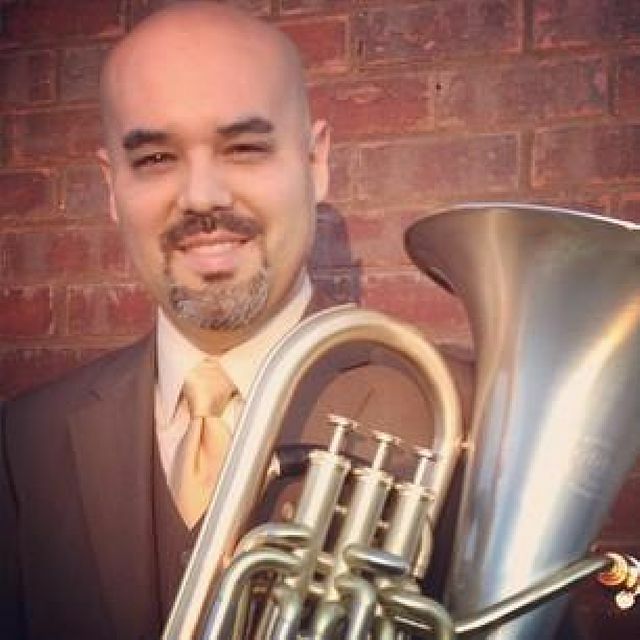 While Demondrae Thurman is one of the leading euphonium soloists of our day, he is also an accomplished chamber musician, conductor, trombonist, composer and educator. 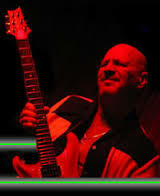 The high level of his work is evident, as are his passion for music and people. 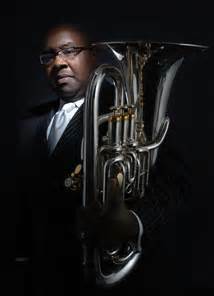 “The Fourth Valve” tm is delighted to host Demondrae Thurman as our first euphonium playing respondent. Enjoy! How did you develop the emphasis you have on musical expression? Sometimes, it is something that people do not think about very much. Please name two different ways you find inspiration to play music. What do you do for a warm up? How has it changed since college? I think any college professor will tell you that they no longer have time for the 45-minute warm-up they did as a student. I used to play tons of Remington exercises before I’d even think about practicing. Now, sometimes I only have a few 10-minute breaks between lessons to do all of my practicing for the day. When I’ve been away from my instrument, I like to play tunes by ear. Themes from orchestral rep, musical theatre, folk songs, whatever – and I encourage my students to do the same. Tunes get you re-acclimated to your horn, they get you listening to sound and intonation, and most importantly they get you thinking about making music. Lately I’ve been playing “Make Our Garden Grow” from Bernstein’s Candide in three or four different keys. After that, I’m ready to go. Rex Martin, my professor at Northwestern, impressed upon me the idea that any musician should be able to play a gig with no warm up, because you never know when you might have to do that. Mark Carlson and I started a routine one summer where we would show up to the practice rooms on Monday morning and play a solo for each other with no warm-up. It was a productive exercise, and I’d recommend it to anyone who feels dependent on their current warm-up routine. What was your first introduction to chamber music, and what chamber music paths did you follow before the BB? Which ensembles? Who were your mentors? (HS, College, Pro). My first experience was a tuba/euph quartet in high school. I didn’t do all that much in college, mostly tuba quartets. 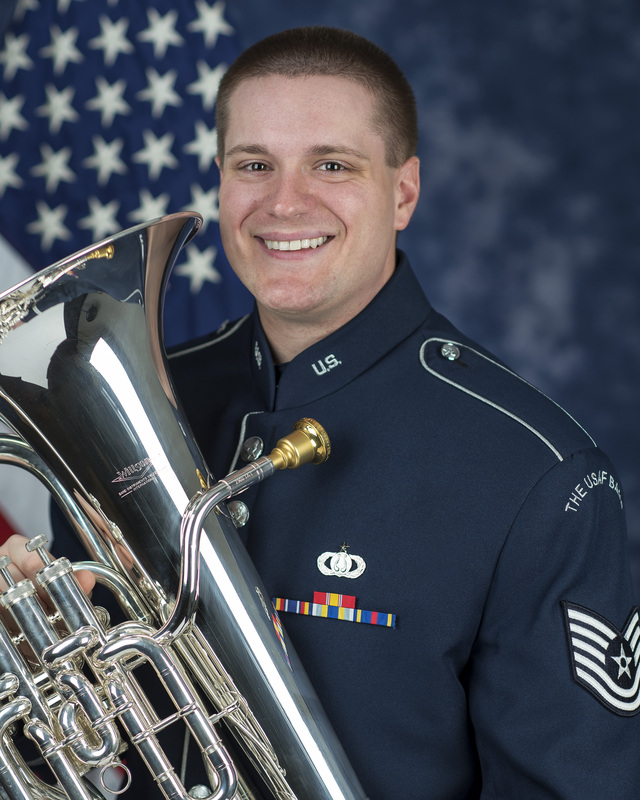 Once I got into the Air Force Band, things really picked up and I ended up playing a lot of chamber music. We had a tuba/euph quartet (with Don Nauman, Gil Corella and Dave Porter) that rehearsed and performed regularly. We even took a couple short tours. The most fun I had, though was in a brass quartet that was the brainchild of trumpeter Bill Adcock. In the AF, we were known as Top Brass and our civilian alter ego was Nothing But Valves (Bill, lucky for me, didn’t like trombone players). Andy Wilson was the other trumpet and Sam Compton played horn. We were very busy as a group. We rehearsed and gigged a lot, I did a lot of arranging and transcribing for the group, we had pieces written for us and recorded a CD. The quartet was an amazing learning opportunity for me in pretty much every respect. Up to that point, I had primarily played in tuba quartets and often had the melody. In NBV, I was the bass voice (we ended up changing instrumentation to two trumpets, euphonium and tuba but I preferred the original instrumentation) and had to be counted on to provide both time and intonation stability. My success at those skills remains open for debate. The other things I learned in NBV were the nuts and bolts of running a small business that happens to be in the music making industry. Division of labor, scheduling, budget, promotion, programming, talking to audiences, negotiating contracts, interpersonal relationships, goal setting. The list is nearly endless. The foundation I learned there helped me later with Boston Brass and currently in my position at Carnegie Mellon University, where I teach classes Music Business and Marketing and Communications, am the freshman advisor and also mentor individual students and groups launch their careers. Jazz is America’s art form and greatest cultural contribution to the world, and yet the average American has become more remote and resistant to it’s allure. What is going wrong? I’m probably the wrong person to ask about this as I really don’t know much. However, being a human, I’ll be happy to give my strong, uneducated opinion anyway! My grandfather was a jazz pianist and I was able to hear him play several times before he passed away. I feel very lucky to have had that opportunity for lots of reasons. I bring this up not to be maudlin but to preface the rest of my answer with the disclaimer that I’m very drawn to those standard “Great American Songbook” tunes. I think they’re wonderful and I enjoy just playing the melodies for enjoyment. Here’s why I rarely, if ever, listen to jazz. I was always taught to listen more than you talk (the length of this interview aside). I feel like to listen to some jazz (more specifically improvisation) is to hear someone talk incessantly without having anything to say. If that were a conversation you’d fake a phone call or sudden onset stomach flu and leave the room. If I’ve got one minute of tune, followed by six minutes of solo, followed by one minute of tune, that ratio is all wrong to me. 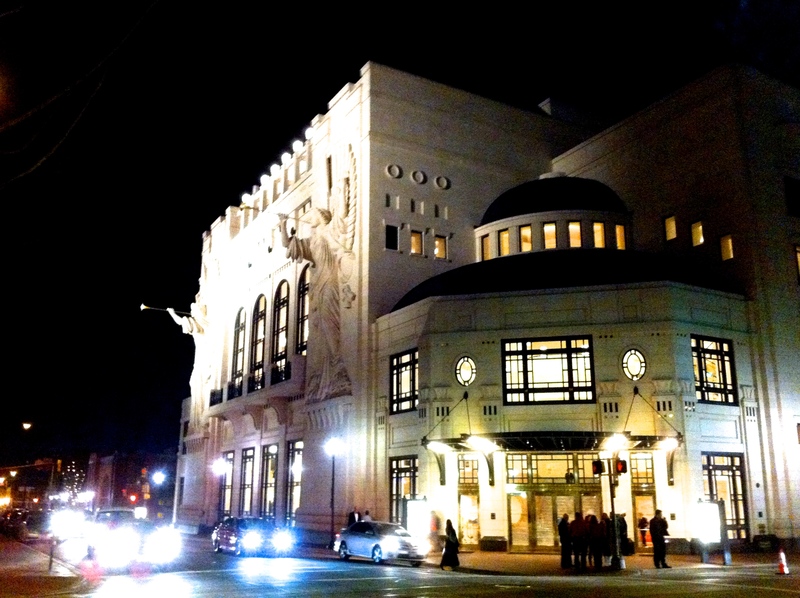 It’s the same idea as the all-Beethoven string quartet show. Who are you doing this for? Of course some people have voices you could listen to forever, whether it’s writing, talking, or improvising. Looking back, one of the things I loved about my grandfather’s performances was his treatment of the tunes. He would often play the tune straight ahead, then morph it into a waltz or samba or whatever. There would be a couple solo choruses but it never dominated the tune. Perhaps if I were more educated about jazz I’d be more drawn to the six-minute solo section, but I’m not sure if requiring a high level of listener education for comprehension and/or appreciation is a good way to increase audiences. I think that the most effective pieces of music or art don’t require the consumer to have undergone a training course to appreciate them. If you are holding a euphonium and a woman grabs you in a passionate embrace, it just might be the tango. If your name is Koichiro Suzuzki, then it most definitely is! 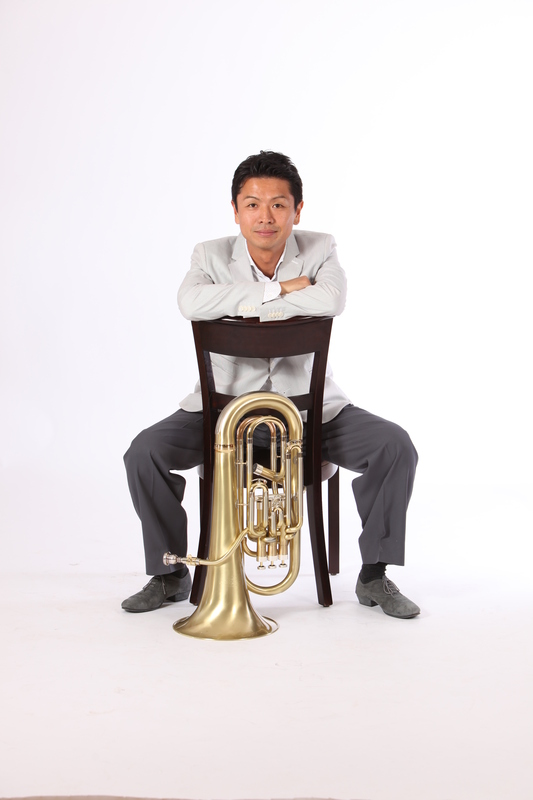 Nurtured by the River City Brass Band, Suzuki has created a niche for euphonium that bears repeating. 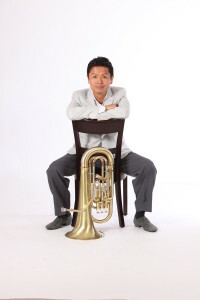 The “Fourth Valve” tm is delighted to host euphonium tango master Suzuki, & we bet we know what you young euphonium players will be doing this summer! When did you fall in love with the Tango? I’ve been in love with Argentine tango since 2004. 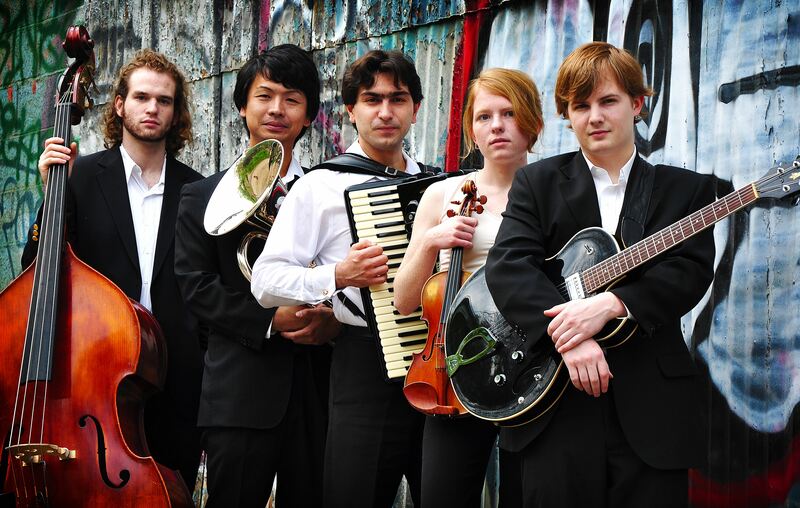 The first time I experienced tango was in a class provided by the University of Wisconsin-Milwaukee-(where I went for my under­grad­u­ate study in music). From that day, I knew that it was something I’d love to do for the rest of my life. Enjoy the rest of the interview here: Koichiro Suzuki 2015. As far as we can tell, you are one of only about five full time tenured professors who are euphonium players nationwide. Why is there such a disparity in numbers as compared with tuba? I have also doubled on trombone most of my life. I would not have this job if I did not play and teach trombone. You may be surprised to find that some of those other guys double some as well. The common college set up is to have a faculty brass quintet with the traditional instrumentation. That leaves us out of luck. Just this year UNF formed an excellent quintet with bass-trombone on the low part and I play the trombone part on euphonium. It sounds great! Your colleagues need to be open minded about instrumentation. Great players will find a way to blend and sound great on any instrumental combination. How did you develop your communication skills, and what was it like to be at the middle of the Rome marching band comment controversy? I’m a lot like my Dad, who never met a stranger, and I love talking to people. I was always in trouble in school over it. I’ve had several East coast people call me the fastest talking Texan they’ve ever heard. Seriously, ask my husband about the talking. So, I guess I’ve just had lots of practice communicating. I was on a plane 20 minutes after we got called to do the interview. I spent the flight writing out notes, guessing possible questions, typing out responses, reading over things, editing, and memorizing the message I wanted to convey. When we landed, I had to immediately call in to Fox and Friends and speak to a producer for a pre-interview. That gave me a good sense of what might be asked, and the tone of the piece. The next morning, I was at the Fox News DC building, going live before I knew what was happening. I was alone in a small studio room, looking at a blank screen. I couldn’t see who was interviewing me or what I looked like, and my only connection to the outside world was through an earpiece. It’s hard to act naturally when you can’t see the person asking you questions. Thankfully the preparation and focus on my flight gave me the confidence I needed to not put my foot in my mouth. The aftermath of the whole brouhaha has been very positive. So many people from across the country got in touch to say “thank you” for standing up for marching bands, for speaking out on a national platform on behalf of these hard working kids. Just the other night, I had a band director came up to me after an Army Field Band concert to talk about it. I think the whole incident shows how much positive power the music community has when we come together on an issue. How has becoming a parent informed your humanity and musicality? Becoming a parent is pretty much all-consuming in the beginning. Giving birth is this incredibly physical event, and for me it was both magical and traumatic. I did not play my instrument for almost six weeks as I struggled to master breastfeeding, allowed my body to heal, and dedicated my energy toward sustaining this new life that was 100% dependent on me for survival. After six weeks, the fog began to lift and I was able to think about the euphonium again. That was convenient, because I had to return to work at six weeks as well. Finding a balance between my music career and my family has been a process of growth. I’ve had to make choices, identify priorities, and become more efficient. Before I was a mother, I would probably say I was most proud of the fact that I serve my country through music, that I am able to make people’s lives better with my instrument. Now, that purpose exists alongside this beautiful calling of motherhood. The biggest way that has informed my musicality is that being a mother has given me a new level of confidence, particularly of what my body is capable. My body made and sustained a human life. My son literally grew from a single cell to a 20 lb, 6-month-old hunk of human from nothing but the nourishment of my body. My body is powerful! That confidence of self can’t help but translate to performance. You are from Fukushima. Can you tell us about your town before and after the disaster? How has the event affected your humanity and your artistry? My hometown is Minamisoma city, which is located about 20 miles from the nuclear plant. Half of people in the city did not have to move to another place, but the rest had to live in a different city. In addition, some people chose to move to a different place although they could live in the city because of the radiation, and many young people have left the town. Therefore, the city is currently not very active. My parents live in the city, so do many of my relatives. After the disaster, many of my gigs were canceled because many concerts had to be canceled. After a month or two, I had usual performance schedule. Since I had nothing to do after the disaster for 2-3 weeks, all I did was practicing. I was worrying about my future at that time. I was thinking that I should be only playing the euphonium. But I realized that all I can do is performing and teaching music (unfortunately, I am not good at doing other things). It was kind of a nice opportunity to think about myself again. What qualities do you look for in a collaborative pianist, and the enjoy about the collaborative process? I am very lucky to have great collaborative pianists around Tokyo. I have several performances with Yumi Sato (perhaps the most famous collaborative pianists for euphoniumists in Japan), and I really enjoy with working with her. I rehearse with an accompanists a lot so that I get comfortable about performing. I tend to choose non-euphonium pieces for my concerts, and many of the works requires rubato. Fortunately, pianists that I collaborate with are good enough to follow me, in addition, they have great ideas about music. I always work with them and discuss about music. What is your concept of sound on the euphonium, and the place of vibrato within it? This is certainly interesting question! What is dark to one person, may be bright to another. I like to think about the ideals of projection, clarity, warmth, and color when I think about my playing. I hope to explore and convey a wide variety of possibilities within those areas. I look at vibrato as an additional option on top of the previous things. I like to use vibrato as a musical tool that can offer a subtle warmth, an intensifying gesture or an impassioned appeal. The absence of vibrato can add a cool and calm feeling to a phrase. My preference is that the vibrato not be an always on, nor an overpowering aspect of sound. It should add something when used. What differences have you noted in teaching and playing styles between the US, Switzerland and Korea? I think everyone is going for the same thing in regards to teaching, namely: a good physical setup, a quality tone, an efficient use of air, a reduced use of muscle tension, and that creative spark. There are differing levels of creativity as well as the color palettes in use. Some artists like subtle colors, others, very strong intense colors! Some are even intentionally monochromatic. Yet, they are all artistic. I generally strive to play with very vibrant colors, but sometimes there is more beauty in a subtle approach that might suit a particular piece better than vibrancy or bombast. I think also that culture and personal character come into play as well. Someone that is more introverted likely enjoys playing a little more subdued but still is feeling the music. The types of ensembles in the country makes a big difference as well. Countries with high-intensity brass bands(like Switzerland and the UK), tend to have much higher technical demands and soloist requirements placed on them in the many competitions. By contrast, wind band focused countries(US and Japan,) tend to have a a basic approach which emphasizes a greater focus on tone and blend-the art of the ensemble player. The brass band players have ensemble skills for sure, but they are different. I always remember my first brass band rehearsal and was shocked by the challenging music. 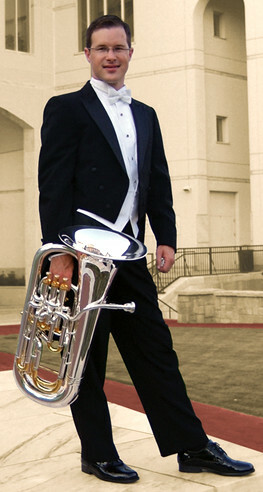 Do you find it ironic that the perhaps the most successful brass soloists in the world play tuba or euphonium? I’m not surprised because of the beautiful sound that these instruments produce. However, we are still fighting an uphill battle for serious musical respectability in the eyes of the average concertgoer/consumer. For many, I think the sight and sound of a large brass instrument in a solo setting is still at bit of a novelty. This is especially true of the tuba, which will probably always have to fight the “Oom Pah Pah” stereotype. I think that to some degree this is even true for experienced listeners. Even for me, it’s still a bit surprising on some level to hear someone make the tuba sound like a voice or a violin. Musicians like Oystein Baadsvik, Pat Sheridan, and Carol Jantsch are really helping to defeat this stereotype. Where do you envision the euphonium in chamber music, and is it important? It’s extremely important. Chamber music has been a huge part of my musical growth and continues to be a major part of my performing career. Since large ensemble gigs are few and far between for euphonium players we tend to put a lot of emphasis on solos. Playing as a soloist is a lot of fun, but nothing will train your ears quicker than chamber music. 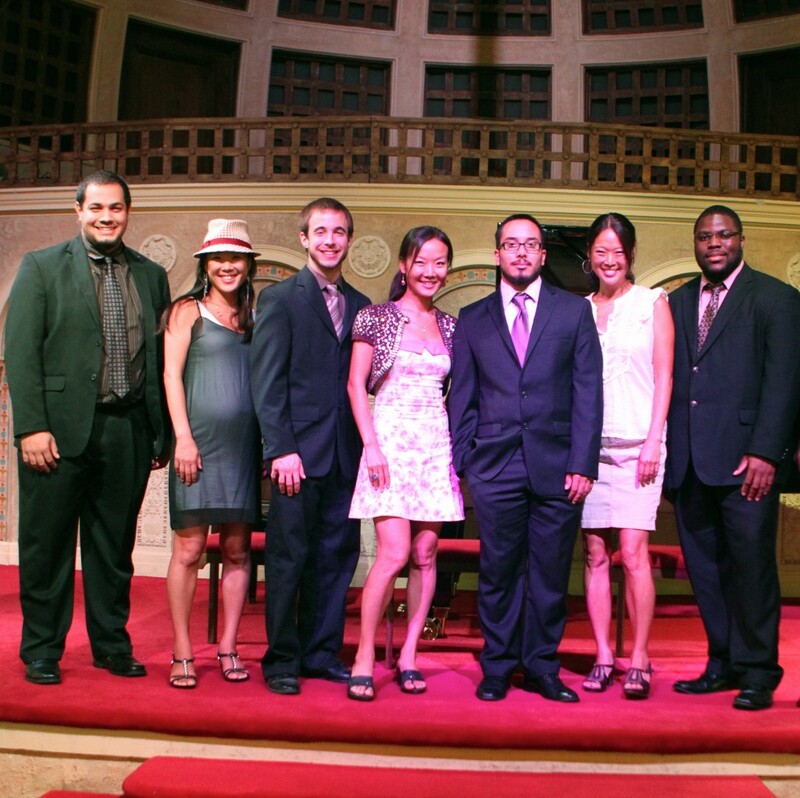 I had the opportunity about 8 years ago to go on tour with the Sotto Voce Quartet on 2nd euphonium. I already knew that they were incredible individual musicians. However, I was blown away by the quickness with which they could blend and adjust to one another. It was a great wake up call for my ears. One of the unique opportunities that I’ve had while teaching at UAB is to be a member of a very active faculty brass quintet playing the horn part. It’s forced me to learn how to transpose and worked wonders for my facility and confidence in the high range. I also feel that I owe a great deal of my sight reading ability to my chamber experiences. Chamber music forces you to deal with conflicts (both musical and non-musical) in a constructive way. This is great training for future teachers and performers. You’re not going to survive very long in any gig if you can’t play well with others. things with the euphonium outside of the standard tuba quartet. Thomas Ruedi and Brian Meixner are both doing great things with euphonium and percussion. 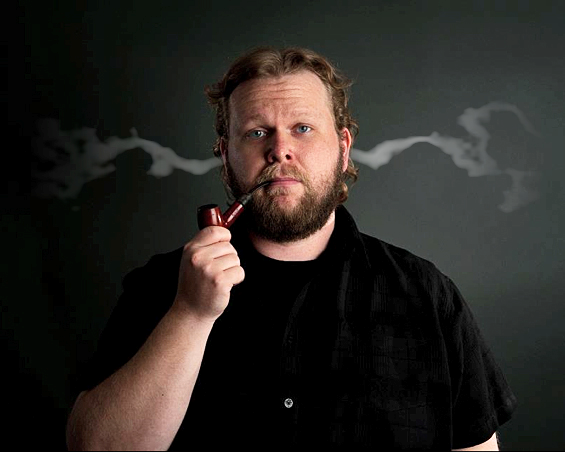 Matt Murchison released a recording that features the euphonium in an Irish band setting. The euphonium quartet is also starting to take off as a chamber ensemble. I also think that we need to get past the idea that euphonium is just a good substitute for the horn, trombone, or tuba. The euphonium is a great 3rd voice in the standard brass quintet and quartet. The key is to get composers on board with the idea. My quintet has had a few pieces written for us. In each case, we specifically told the composer that we wanted the piece to be conceived with euphonium in mind as the 3rd voice instead of the horn. This has led to some interesting conversations. A lot of composers are mostly unaware of the technical capabilities of the euphonium. Many see us as an extension of the tuba voice and are pleasantly surprised when they hear what we can do. 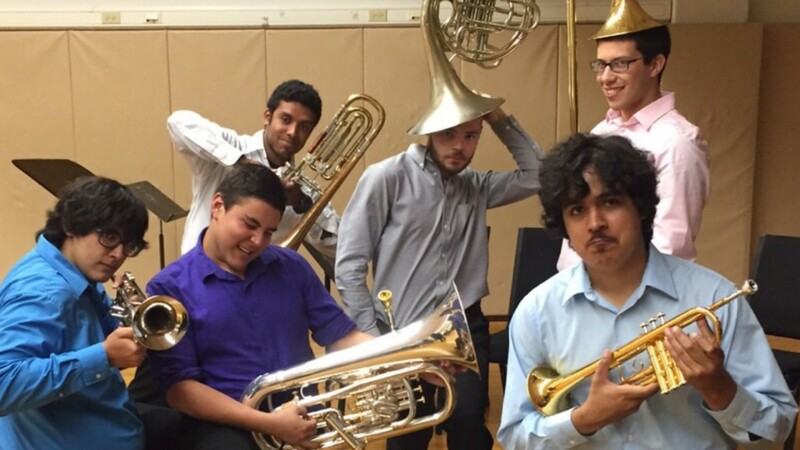 The Kendall Campus Mixed-Low Brass Quintet was one of the three student groups invited to perform at the 2015 International Euphonium & Tuba Conference 2015. The finale of their presentation was an arrangement/transcription of Horace Silver’s Senor Blues which was arranged for them by the group’s coach, Dr. David William Brubeck. Members included Gabriel Benitiez on tenor trombone, Armando Alicandu and Michael Contreras on euphonium, with Anthony Lupo on Tuba. The group was originally formed as a quartet for two tenors, one bass, and tuba, but the standard instrumentation includes four or five players, with at least one each of tenor tbn., bass tbn., euphonium and tuba. We have found mixed low brass a wonderful variety of colors and possibilities. As you can see, they were once coached by the incredible Ahn Trio. The Kendall Brass Quintet was also one of the three student groups invited to perform at IET 2015, and gave a performance that was a veritable demonstration of the use of euphonium in standard chamber music for brass. The group featured the euphonium as the bottom of a brass quintet in an arrangement of Habanera from Carmen and in Rondeau by Mouret, as the bottom of a quartet in their rendition of the Allegro from Ramsoe’s Brass Quartet No. 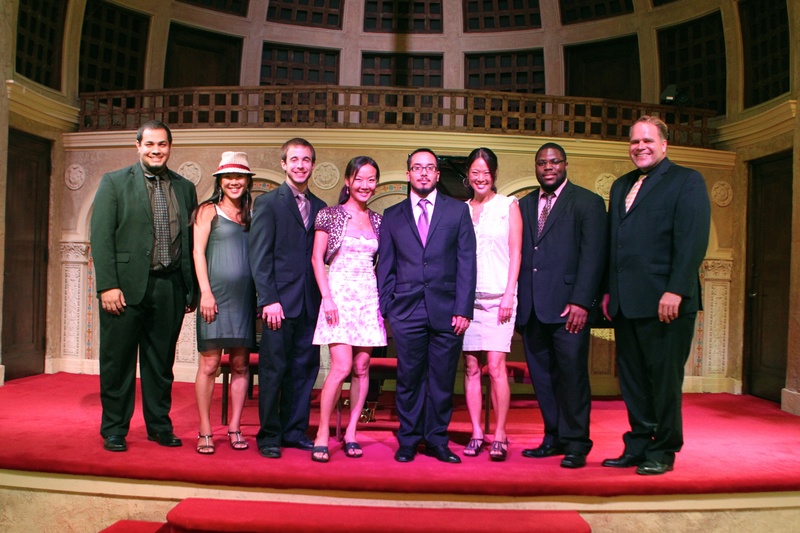 4, and as a middle voice of a quintet with the premiere of a Latin jazz/salsa version of Johan Sebastian Bach’s Prelude and Fugue in C minor (transposed), by the Kendall Campus’ virtuoso bass teacher, Salsa Ensemble leader and arranger, Rafael Valencia. 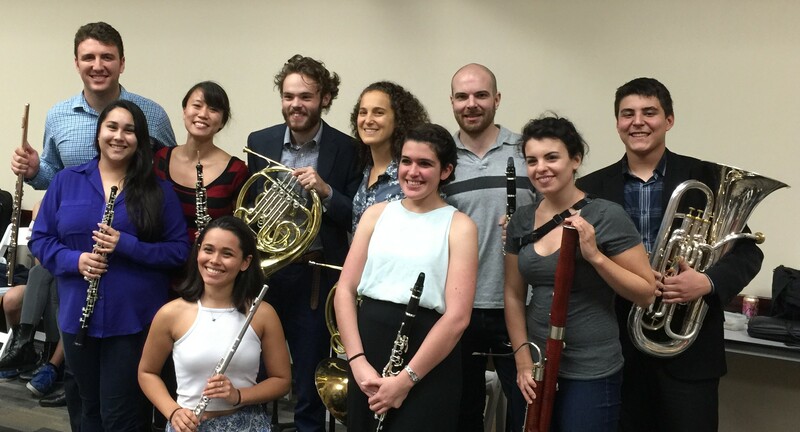 The group has performed in masterclass for Boston Brass, Dallas Brass, and Chuck Lazarus. In fact, we became so accustomed to searching out new chamber music possibilities for euphonium in chamber music, that we tried woodwind quintet. Then Windsync came to coach the group, and their bassoonist, Tracy Jacobson, said that she actually preferred the euphonium to the bassoon for one of the pieces they performed in masterclass. Next thing you know, this just sort of happened….